Nongame rescues dolphins by ... hukilau? New nongame license plate takes flight! The last time a license plate was introduced to help conserve Georgia's nongame wildlife, Paul McCartney was 63, George W. Bush was in his second term and Twitter was months from uttering a tweet. Tomorrow, that wildlife tags timeline will change. Significantly. Watch your inbox for the announcement of a vibrant new design focused on giving nongame a chance! A Lee County swamp recently produced what could be mistaken as a sampling of the second plague. 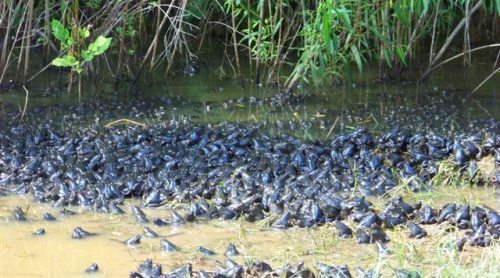 Chief County Marshall Jim Wright was checking the site near Leesburg last month when he saw thousands of the largest tadpoles he’d ever seen. That sight was topped a few weeks later when he returned to find the tadpoles metamorphosing en masse. Frogs, many still sporting tails (left), crowded the bank, covering an area 10-15 yards long. John Jensen, a senior biologist with Georgia DNR's Nongame Conservation Section, was also amazed. After reviewing photographs, Jensen said Wright witnessed a massive, synchronous emergence of river frogs: thousands of tadpoles changing into frogs at the same time. Such events are sometimes seen with toad species that develop quickly, but less so with frogs, because their tadpoles develop at differing rates depending on how much individuals eat and other factors. 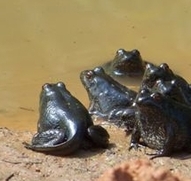 Jensen said the mass emergence of river frogs – the first he had heard of – was made more possible because tadpoles of this large Coastal Plain species tend to school together, feeding at the same time on the same things, which could keep their development on a similar pace. Still, the odds of the emergence that Wright documented are low. It can take a year for a river frog to go from egg to mature frog. “I think they just … all developed at the same time, and they were ready to come out,” said Jensen, who helped author "Amphibians and Reptiles of Georgia." Wright checked last week and the frogs had not yet dispersed into the swamp. However, they were more scattered. The first time he saw the frogs they appeared almost in rows, each facing up the bank. “It looked like they were all looking at a movie theater,” Wright said. Before using it to free dolphins last month, Nongame natural resources technician Nicole Brandt hadn’t heard of hukilau, much less tried making the net central to this ancient Hawaiian fishing technique. But hukilau proved the trick for coaxing two bottlenose dolphins out of a tidal drainage ditch on Little St. Simons Island and toward open water. Pronounced hookee-law, the tactic involves casting a net lined with leaves and then pulling it in to corral fish. Huki means pull; lau means leaves (and, yes, there's that song). Brandt’s version, made of gear from Nongame’s storage shed and a local hardware store, was more curtain than net. It consisted of a floating line interspaced every 8 inches with vertical, weighted lines. “Basically, we were trying to create an acoustic barrier for the dolphins,” which use sonar to navigate murky water, she said. 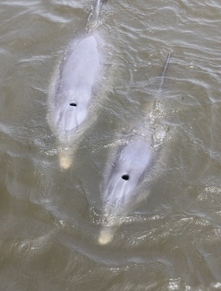 During a high tide in late April, four dolphins had moved into the ditch upstream of a beach causeway bridge on Little St. Simons. Two days later, two of the dolphins – apparently a mother and older calf – were still in a pool at the bridge. Although they could have swum under the bridge at high tide, they wouldn’t, possibly because oyster beds under the bridge appeared to block their passage. As Little St. Simons staff monitored the dolphins, it became apparent they weren’t leaving. Netting the dolphins wasn’t an option: The oyster beds posed a risk for the animals and rescuers. Blair Mase, Southeast regional marine mammal stranding coordinator for NOAA, suggested a hukilau to DNR Nongame Conservation Section biologist Clay George. Mase had read about hukilau in a book by late marine-mammal researcher Kenneth Norris, and successfully used the method to herd dolphins through a long canal in Louisiana. “I think it was the perfect tool for this situation,” she said. On May 3, Brandt and George pulled the floating screen across the pool (above). Nongame Program Manager Jason Lee and Little St. Simons’ Stephanie Knox followed with long poles, occasionally whacking the water to reinforce the hukilau as a barrier to avoid. Abby Sterling videoed from the bridge. The first try failed. Agitated, the dolphins bolted upstream through the weighted lines. The crew let the dolphins return and calm down, then tried again. This time, rescuers moved even more slowly. It worked. Sterling recorded the dolphins' escape, as the pair stopped circling and surged under the wooden bridge and through the marsh ditch. Brandt said the dolphins surfaced 100 yards downstream, then weren’t seen again as they swam in the direction of Mosquito Creek. Photographs taken of their dorsal fins will allow researchers to verify the identity of these dolphins if they're seen again along the Georgia coast. The Nongame Conservation Section responds to stranded dolphins as coordinator of the Georgia Marine Mammal Stranding Network. Call (800) 272-8363 (800-2-SAVE-ME) to report a stranding. Brandt doesn’t know if Nongame will use the hukilau again. But if so, she’ll be ready. Watch video of the dolphin rescue! 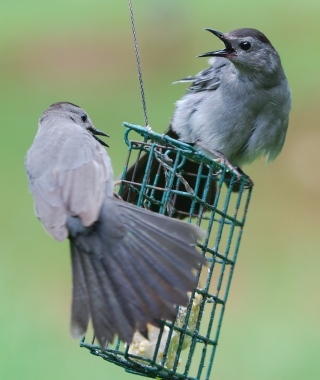 At one time, like most Georgians, I stopped pouring seeds into my bird feeders when winter gave way to spring. I would not resume feeding until frost blanketed the ground in autumn. However, more than 25 years ago I began feeding birds into summer and beyond. This has dramatically enhanced my enjoyment of the birds that live in my backyard. While you will see fewer birds in summer, you might pick up some new feeder favorites – from stunning blue grosbeaks to feisty gray catbirds. Learn more about summer feeding in Terry’s complete column. Included is a recipe for “bird butter,” a homemade suet that birds find almost irresistible. Terry W. Johnson is a former Nongame program manager with the Wildlife Resources Division and executive director of TERN, the Nongame Conservation Section’s friends group. Check out his column archives. Black-bellied whistling-ducks nesting in middle Georgia is uncommon. 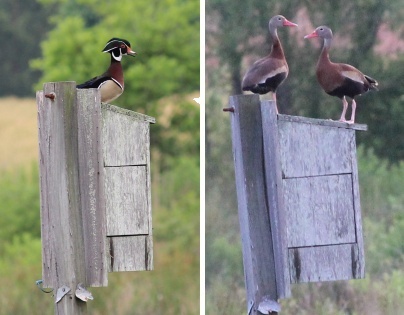 Even more uncommon: The pair of “tree” ducks at Di-Lane Plantation Wildlife Management Area is sharing a nest box with wood ducks. And we’re not talking just a few eggs. The black-bellied duo has 12 eggs; the wood ducks have seven, said Steve Kyles, manager of the Burke County WMA. “In the mornings, I’ve seen wood ducks sitting on (the box), and in the evening, tree ducks sitting on it,” Kyles said (photos above). Species such as hooded mergansers and black-bellied whistling-ducks – commonly called black-bellied tree ducks – sometimes target wood duck nests for dump nesting, where more than one female lays eggs in a nest. But the egg total in the Di-Lane nest is not the norm, DNR state waterfowl biologist Greg Balkcom explained. The question is which female will take control. While some of the eggs won’t hatch, if they were all laid at about the same time, the winning duck may end up raising a large and mixed brood. The eggs take about 28-29 days to hatch. Larger clutches in dump nests have lower hatch rates. Once found from South America to Texas, black-bellied whistling-ducks are expanding their range. Balkcom has heard of sightings this year reaching along the Atlantic Coast to Virginia. Georgia’s first confirmed nest was in 2006 in Brooks County, according to "The Breeding Bird Atlas of Georgia." The species is now nesting as far north in the state as Phinizy Swamp Nature Park in Augusta. Balkcom plans to use photos and egg measurements from the Di-Lane nest to help staff ID possible black-bellied duck eggs next year, giving a clearer picture of the species’ expansion in Georgia. Mole kingsnakes live mostly underground, making any sighting a treat. But the 3-and-a-half-footer that DNR technician Frank Manning caught at a White County Christmas tree farm – the owner called after repeatedly seeing an unusual brown snake – is the first mole kingsnake documented in that county. The snake was released back into the area. Add state Project WILD Facilitator of the Year to the list of honors for Amber Mooney. 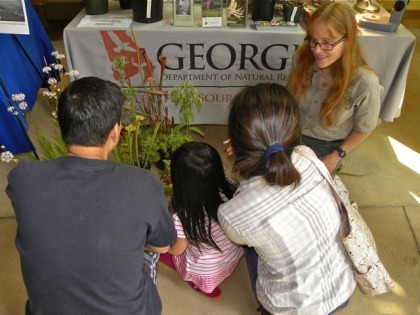 A seasonal naturalist at Charlie Elliott Wildlife Center since 2011, Mooney was named Georgia’s top Project WILD teacher for 2013. She developed and held more than a dozen Project WILD, Growing Up WILD and Flying WILD workshops. Wondering about the whimbrels fitted with transmitters in Georgia last month (“On the trail of whimbrels," May 31)? Cabretta, Mackay, Ossabaw and Wolf are in Canada near Hudson Bay. Postel and Gould, whimbrels tagged last year at St. Simons Island, have made it to respective breeding grounds at Hudson Bay and the Anderson River in the Northwest Territories – more than 3,000 miles from Georgia's coast. Follow the whimbrels. In other waterbird work, Nongame Conservation Section staff continued monitoring shorebird migrations as part of an East Coast effort to estimate populations of declining species. Biologists also surveyed from the air all known seabird colonies in the state, and -- helped by Little Simons Island employees -- banded the first American oystercatcher chicks to reach 30 days old this season. After a slow start, loggerhead sea turtles had produced 515 nests as of June 11. May totals were only slightly below average for the month and a late swell in nesting – Cumberland Island recorded 17 nests May 29 – could point to a stronger season than early returns suggested, according to DNR Sea Turtle Program Coordinator Mark Dodd. Nesting updates. Sea turtle eggs sampled from each recorded loggerhead nest in 2012 are being analyzed through a joint DNR/University of Georgia project. About 97 percent of last year’s nests – 2,180 egg clutches – have been linked to 734 females, Dodd writes. at Atlanta Botanical Garden June 8.